Blast the Wood Out of Small Hollow Vessels! The round shafts of these tools can be rotated slightly to make clean "shear" cuts and the bent tool is also very useful for undercutting the openings on larger hollow vessels. Set of one straight and one bent tool includes replaceable Hunter #1 carbide cutters for clean cuts and durability, and a Torx wrench for rotating and replacing the cutters as needed. The Hollow-Pro� Tools� 3/8" ROCKET straight tool is a very versatile and efficient tool that can be used to remove wood quickly and easily from hollow vessels and open bowls. It also works very well for hollowing out boxes. The Hollow-Pro� Tools 3/8" ROCKET� bent tool was designed to hollow vessels up to about 7" in diameter, but is also intended to be used on larger pieces as well. By using the smaller tool to undercut the first portion of larger vessels the tool rest is closer, resulting in a cleaner cut and greater control. The larger Hollow-Pro� Tools� bent tools can then be used to continue hollowing pieces up to about 14-15" diameter. Hollow-Pro�� Calipers are precision made from steel and aluminum for maximum strength while maintaining a comfortable light weight. The Small size will work for hollow forms up to about 8" in diameter and up to 6 1/4" deep. The Larger size works for hollow forms up to about 18" in diameter and up to 11 3/4" deep. These Hollow-Pro� Calipers provide accurate measurements in crucial areas of hollow vessels and open bowls. Right - Bottom thickness�This is the important measurement to enable you to re-chuck the bottom and KNOW how much wood you have to work with. This works equally well on open bowls! 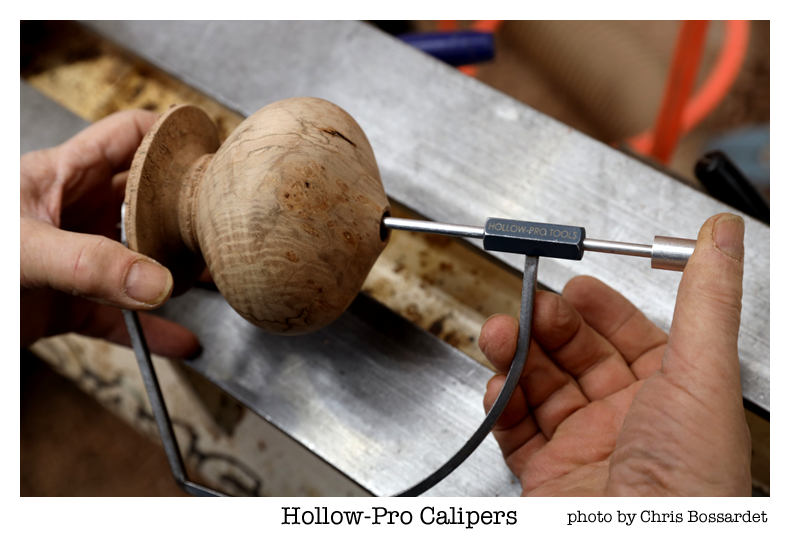 Hollow-Pro� hollowing tools are designed by professional woodturner Mike Jackofsky. Manufactured in the USA by the Hunter Tool Company; Hollow-Pro� Tools are available at Craft Supplies USA. These fine turning tools feature a unique internal swivel tip with a negative angle built into the tip. These tools have been specifically designed to use the Hunter carbide cutters; the negative angle makes the carbide less aggressive and easier to control. 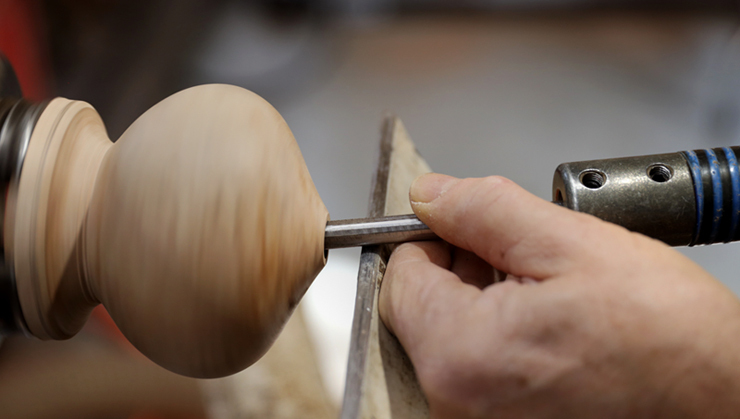 They will remove wood quickly and efficiently from open bowls and hollow vessels. The tools use both #1 and #2 size carbide swivel tip cutter assemblies and the M4 powdered metal scraper which is recommended for final finish cuts. The swivel tip cutter assemblies and scraper are sold separately. Both the 1/2" and 5/8" tools are designed to fit into any large handle with a 5/8" opening. The basic carbide cutter for all the Hollow-Pro�� 1/2� and 5/8� tools is the #1 swivel tip cutter assembly. The M4 scraper is also highly recommended for use with all 4 tools. Mike uses the carbide cutter for most of his hollowing and then switches to the M4 scraper to achieve his final wall thickness.� The scraper is also his choice to remove the �nub� at the bottom. The most versatile and basic Hollow-Pro� � setup consists of the 1/2� straight tool, #1 Swivel tip cutter assembly, and the M4 scraper and this is Mike�s favorite hollowing tool. The #2 standard swivel tip cutter assembly� - only recommended for rapid, aggressive wood removal, using the 5/8� straight tool.This is an excellent choice for open bowls. The #2 negative swivel cutter assembly� - gives less aggressive cuts with all the tools, similar to a scraper that doesn�t need to be sharpened and some turners prefer this cutter for the bent tools. IMPORTANT: The tool rest height should be adjusted so that when the tool is held straight (parallel to the bed of the lathe) the tip is cutting at the center line of the turning.� For less aggressive cuts, raise the handle slightly. Avoid lowering the handle, as that will raise the cutter tip and could result in a very aggressive angle of cut. Tighten the swivel tips securely with the included Torx wrench. 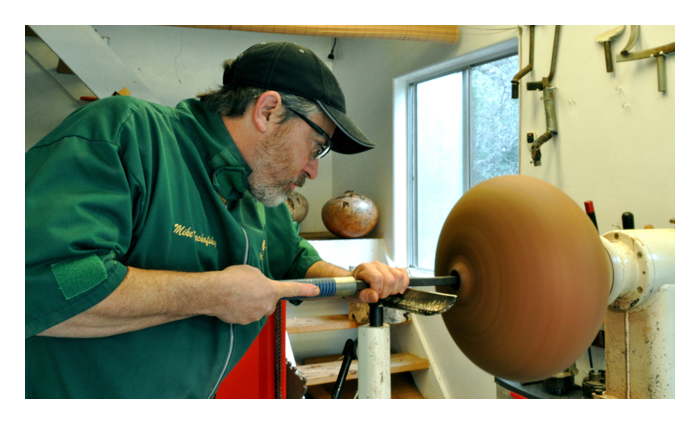 Mike recommends holding the handle against your body and practicing with the tools on an open bowl before using them on a hollow vessel. TIP: To avoid stripping out the Torx screws, make sure you clean them out before tightening or loosening them, so the wrench can seat properly.� An airgun and/or a small piece of wire or a sharp pointed object like a dental pick or a safety pin, works well. Straight hollowing tools are easier to control and more suitable for turners learning to make hollow vessels. The use of a bent tool is necessary for many hollow form shapes, but requires more experience to master. The Hollow-Pro� Tools 1/2"� and 5/8" straight tools are very versatile and efficient tools that can be used to remove wood very quickly and easily from hollow vessels and open bowls. These tools accept both the #1 and #2 size swivel tip shafts, but Mike recommends the #2 size for the larger 5/8" tool. All bent hollowing tools that are meant to be hand-held should only be used with the straight part of the shaft on the tool rest. With Hollow-Pro� Tools this indicates that the shaft is aligned with the cutter, making the tools easier to control. The tool rest height is particularly important when using bent tools, so make sure the tip is cutting on the center line of the turning and that you are not lowering the handle, which raises the tip to a more aggressive angle. 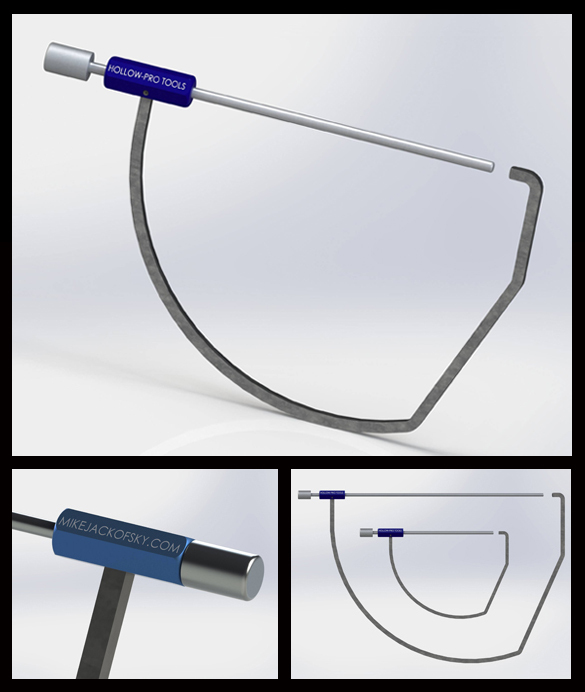 The Hollow-Pro� Tools1/2" bent tool was designed to hollow vessels up to about 8" in diameter, but is also intended to be used on larger pieces as well. By using the smaller tool to undercut the first portion of larger vessels the tool rest is closer, resulting in a cleaner cut and greater control. The larger Hollow-Pro� Tools 5/8"� bent tool can then be used to continue hollowing pieces up to about 14-15" diameter. Made from high quality M4 powdered metal, they are sharpened with a 75 degree grind and have been heat treated to HRC 62-64. The scrapers may be resharpened with a diamond hone or light careful grinding. Since all Hollow-Pro� Tools have a built in negative angle at the tip, when the M4 scrapers are inserted the result is a clean, less aggressive, final finish cut. Mike recommends using the scraper for your last few cuts, when you are close to your final wall thickness. My 4 tools together are a complete hollowing system, with different choices of tips, depending on what size hollow form and what type of wood you are turning.� They are made in Minnesota by Hunter Tools and they use his nano-carbide� cutters that last a long time and don't need to be sharpened.� Sometimes I need to try and see what cutter tip will work best, depending on what I am turning.� If you have all the tools and cutters, you have more choices of options, to try and see what works on a particular piece of wood. I use all 4 tools to make my bigger pieces up to about 14-16" diameter and I use just the 1/2" tools to make pieces up to about 7-8", so it depends on what you want to make.� If you are buying tools with the idea that you will be making bigger pieces at some point, the 5/8" tools might be something you would want. All the different tips fit all the tools, but I like the standard #1 cutter assembly for the 1/2" straight tool, the standard #2 cutter assembly for the 5/8" straight tool and the #2 negative cutter assembly for both the bent tools. But I also use the negative cutter assemblies, which are less aggressive, for finish cuts with the straight tools as well.� The M4 powdered metal scraper works great with all four tools. 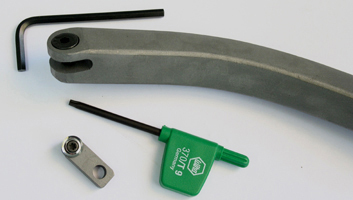 All the tools require a handle with a 5/8"� opening, like the Oneway or Hosaluk handles. The straight tools are easier to use and they are fast, efficient and fun, compared to bent tools.� I like the 5/8" straight tool for open bowls as well as hollow forms and I have even used the 1/2" straight tool for a little spindle turning!� If you are a beginner or don't have much experience at hollowing, I might start with the straight tools until you get comfortable with them, but there will be shapes where you won't be able to reach.� The straight tools are pretty easy to use and I teach people that you want to remove as much wood as you can with straight tools and only go to the bent tools when you have to.� If you make shapes with a big enough opening, you can do all the hollowing with straight tools, but if you get into making smaller openings, or more difficult shapes, you will need bent tools as well. If you want to make pieces up to about 7-8" diameter, I would get the 1/2" tools, a standard #1 cutter, a #2 negative cutter and the M4 scraper. If you get those tools, you would already have the cutter assemblies(except the standard #2) for the larger tools as well, so you would just need the tool shafts themselves to have the whole set, if that is what you want. For more info on the use of Hollow-Pro Tools�, please visit the Video Page to view excerpts from Mike's tutorial DVD "Woodturning with Mike Jackofsky: Making a Hollow Vessel"
To purchase Hollow-Pro� Tools or the DVD� visit Craft Supplies USA. Please wear safety glasses and follow all safety rules of woodturning. These tools are aggressive hollowing tools and should be used by or under the supervision of experienced turners.